IU Southeast was recently awarded two grants from the IU Women’s Philanthropy Leadership Council, an organization that strives to inspire women to give of their time, talent and resources to Indiana University, and to develop women leaders in philanthropy. The first grant will be used to support the Dean’s Alliance, an organization created by Kelly Ryan, dean of the School of Social Sciences, which aims to retain and assist students by connecting them with peers and providing a support system. The organization targets new and transfer students entering the School of Social Sciences and helps them through challenges that could prevent them from persisting. By providing support and immediate interventions, the program helps first-generation, working moms and other students persist to graduation. The Alliance promises first-class access to academic advisors and a faculty member in the student’s major and weekly events with Dean Ryan. Funds from the grant will be used to incentivize the program with scholarships students can gain from attending meetings. 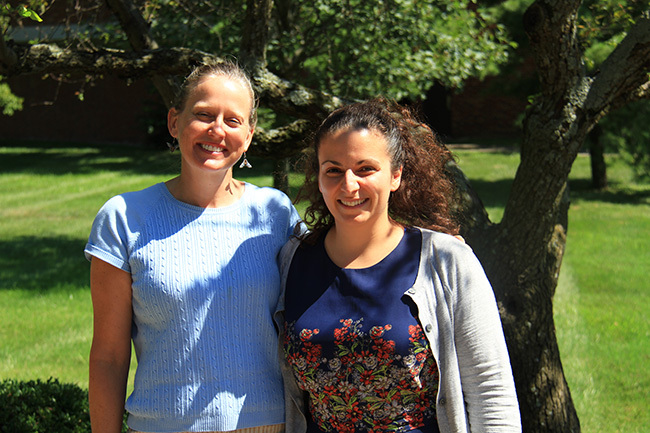 Dean Kelly Ryan and Academic Advisor Mary Grandinetti. The second grant is an extension of a previous grant received by Julia Mattingly, assistant professor of nursing, for her work at the Pine Ridge Reservation in South Dakota. The reservation is home to the Lakota Sioux tribe, which has high rates of diabetes, obesity and heart disease as well as inadequate health services. The first grant lifted the financial burden of travel expenses and allowed nursing students to travel to Pine Ridge to engage in service learning and provide screenings and other medical services to residents of the reservation. The second grant will fund the purchase of telehealth technology for use by nursing students during screenings. This will allow students to track the participant’s results, and provide follow-up beyond the annual visits to the reservation. Through technology provided by TeleMed 2020, a telehealth company focused on improving the quality of health care and reducing costs with technology, the screening method will be transformed using an electronic data capture platform. 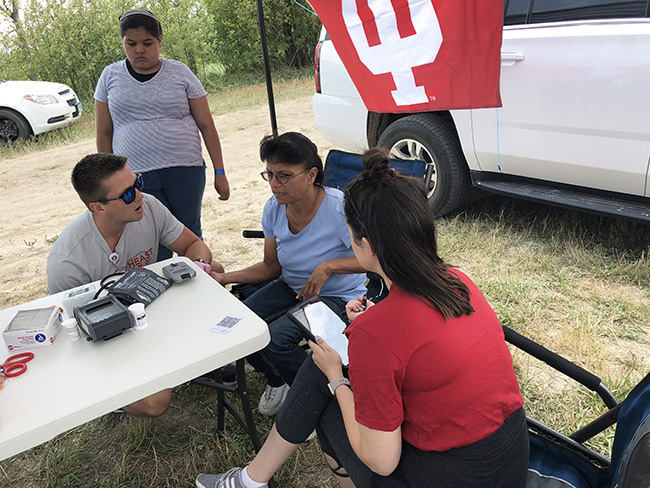 IU Southeast nursing students performing screenings at the Pine Ridge Reservation.